Read edged their way towards the right end of the Ribblesdale Cricket League with a 60-run victory over Brinscall at School Lane. Read, who haven’t won the competition since 2004, climbed to sixth in the table after following up their win over Salesbury last week. Former skipper Kyle O’Connor and William Wrathall got the visitors off to the perfect start with the bat, putting on a stand of 73 runs for the opening wicket. O’Connor hit eight boundaries on his way to top-scoring with 44 from just 50 balls while Wrathall added 38. However, the breakthrough for the hosts forced a collapse and as wickets fell regularly the away side slipped to 87-6. Bailey Richards (31) and captain Andrew Rushton (18) steadied the ship at the tail end as Read ended the innings on 153. In replay, professional Matthew Walker was masterful with the ball and it was his 12-over spell that seriously hit the home side’s hopes. The former Lowerhouse all-rounder took 5-42 with Richards and Rushton adding a couple of wickets apiece as Brinscall were wiped out prior to reaching three figures. Meanwhile, Padiham’s winning streak came to an end at Church Meadow as they fell 45 runs short in their pursuit of Ribblesdale Wanderers. The hosts owed batsman David Howard a huge debt of gratitude for his knock of 73, which included 10 fours and a solitary six, as they finished up on 168-7. The top-scorer put on 82 for the third wicket alongside paid man Primosh Perera (28) and another 48 for the following wicket with Andrew Needham (23). 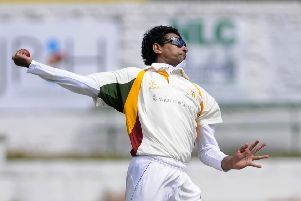 Padiham professional Siviwe Gidana did his best to restrict Wanderers with three wickets from a 13-over spell while Toby Burrows and Jimmy Gray chipped in with two wickets each. Callum Clarke was then the stand out performer with the bat in making 80 having faced 105 deliveries. The one-time skipper record five fours and four sixes in reaching his tally but he was left to do battle on his own by his team mates.